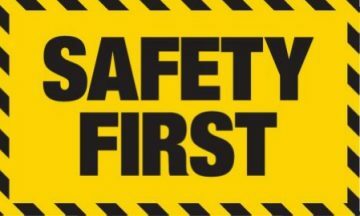 There are many potential hazards that can be avoided simply by minding certain safety guidelines. Some of them concern your HVAC system and others are for general home safety. Custom Climate Concepts has compiled this list of “must do’s” in order to keep you safe in your home. Since we are in a hurricane zone, it’s essential to educate yourself and take precautions when necessary. Your plumbing, electrical and HVAC systems and services are impacted by hurricanes. There are several things you should do to prepare, like consider purchasing a generator, cover your HVAC unit, and ensure your roof gutters and downspouts are clear of debris. Check smoke alarms and carbon monoxide detectors. Test your smoke alarms and carbon monoxide detectors at least once a month to make sure they operate correctly. If you hear chirping, replace the battery right away. If you don’t already have a carbon monoxide detector, get the help of an experienced technician to determine what would be best for your home. Test indoor air quality. Poor indoor air quality can lead to health concerns like severe allergies, respiratory problems and more. Custom Climate Concepts offers indoor air quality testing, duct cleaning and sealing. Add non-slip materials to the tub or shower. Bathrooms can be very dangerous because of the water, moisture and items on the floor. Tubs and showers can also create tripping and falling hazards. Consider adding non-slip mats, tiles or strips to your shower or tub to help prevent accidents. Check settings of the water heater. If your shower heats up too quickly, or the water is too hot in general, check the settings of your home’s water heater. If it’s set higher than 120 degrees, consider lowering it. Keep a flashlight by the bed. Keeping a flashlight by the bed is a simple way to make sure that if a breaker gets tripped or the power goes out in the middle of the night, you’ll be able to find your way in the dark. Getting out of bed unexpectedly in dim light could lead to trips and falls. Safety doesn’t stop with these tips. Contact the certified, expert technicians at Custom Climate Concepts for a complete HVAC evaluation and for current special pricing.